No matter how you go about it, planning a wedding is stressful. That’s why a bachelorette party is not only tons of fun, but also beyond necessary. Letting your hair down with the girls for your last few moments of semi-single freedom is what it’s all about, so it should be a celebration the entire time. Once you’ve got the date and the guests figured out, all you need to do is pick the ultimate bachelorette location. Maybe you’re not planning a destination wedding, but that doesn’t mean you can’t still get away. Here are some of top bachelorette party spots. Depending on the type of trip you have in mind, you’ll be sure to find one that’s a perfect match for you. Cabo San Lucas Mexico. 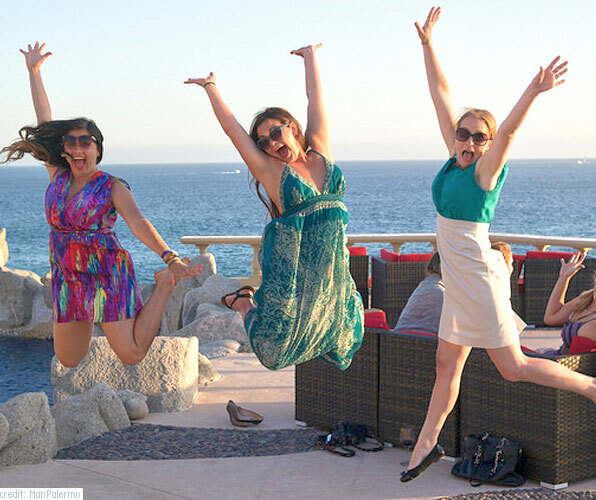 If you’ve watched the “Real Housewives of Orange County,” “The Hills” or “Laguna Beach,” you already know that Cabo is the place to be, because these ladies act like they’re at a bachelorette party every weekend. If sipping margaritas on a white sand beach sounds like your thing, you’re probably going to like it here. Don’t worry, there’s plenty else to do. Sunset cruises, sushi bars and clubs are all part of the Cabo fun. Las Vegas, Nevada. At a place that’s known for a wild time, we’d say you’re in pretty good hands at Vegas. If you’re down for some awesome clubbing and, of course, gambling, this could be the perfect choice. If you’re feeling a “Magic Mike” kind of vibe for the weekend and are ready to get rowdy with the girls, book your tickets for Hunk-O-Mania now. Napa Valley, California. Maybe gambling and beaches aren’t your thing, but wine tasting is. We don’t blame you one bit, but if you’re thinking wine, think Napa Valley. Make the trip fun and educational, while getting chauffeured around in a party limo-bus. Wine is not the only thing on the itinerary, but wouldn’t that be fun? There’s also lots of great spas, restaurants and shopping to explore. Miami Beach, Florida. Get away from the cold weather and go bask in the Miami sun. With some of the best places to dine, party and relax, Miami is a no brainer. Don’t forget to get pampered while you’re there; book a girly and fun blow-out trip with the rest of your group at Blo Blow Dry Bar, and turn it into a party. Dover, Delaware. If you’re writing off Delaware for a potential bachelorette hot spot, think again. Live harness racing, poker games, concerts and spas are all part of the Dover experience. Rated AAA with the Four Diamond Award, Dover Downs Hotel & Casino knows how to please its guests. Charleston, South Carolina. There is nowhere that mixes beauty, charm and relaxation as eloquently as Charleston. If clubbing is not your thing, Charleston could be a great destination. Explore the lovely downtown market on a carriage ride, and soak in all of the history. Enjoy outdoor lunches, live music and pampering all weekend long. New York City, New York. It’s no secret that New York City holds some of the hottest night clubs, shops and restaurants you can find. Booking your trip here will ensure that you’ve got plenty of choices for what to do. Go see a Broadway show, hit a rooftop bar and be tourists for the weekend. You can’t go wrong when you’re in New York City. Whatever you have in mind for this weekend to remember, you are sure to have a blast at any of these locations. All you’ll need now is the right shoes and some delicious champagne. Kayla Matthews is a writer and blogger who contributes to Girl’s Getaway, AFAR Magazine and The Huffington Post. Follow Kayla on Google+ and Twitter.